Birding enthusiasts will love the nearby Cabo Blanco Nature Reserve, filled with exotic birds and rich vegetation. Take a day trip to the breathtaking Tortuga Island where you'll snorkel and swim in the crystal blue waters and hike along white sand beaches. Sail through the sky on an exhilarating canopy tour, affording a bird's eye view of the jungle canopy below. 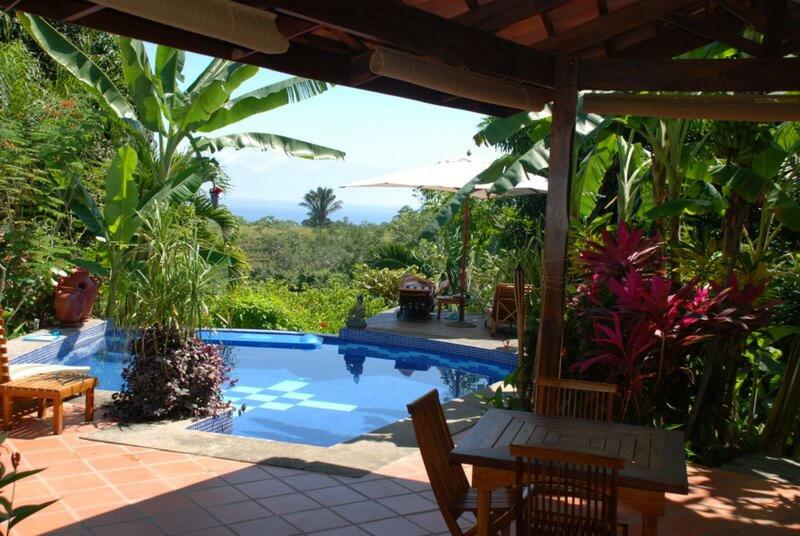 The lodge is perched on a hill, somewhere between heaven and sea, offering views of the jungle and the ocean. Inspired by the vibrant natural setting, the hotel is designed and built with beautiful local woods, stone and terracotta floors, creating a relaxed, romantic atmosphere. Swim in the blue tiled swimming pool surrounded by lush tropical gardens or venture out on a peaceful horseback ride and view the amazing countryside and rolling hills. The relaxing, romantic outdoor patio restaurant serves delicious and creative tropical Mediterranean cuisine. Creating a pleasing synergy with the lush tropical surroundings, all rooms evoke a harmony of nature, design and a comfortable relaxing ambiance. Rooms are designed with exotic woods, coral stone floors, unique locally hand-crafted furniture and large private decks. The Jungle View rooms open out onto a private terrace with a hammock and the Tropical Garden rooms offer a small terrace fronting a beautiful tropical garden. "The room was clean and comfortable, the staff very kind and attentive, nothing was too much trouble. Our host cooked us delicious meals each evening. The wildlife experience was amazing, the sounds and sights of the jungle all around us. A troupe of howler monkeys visited twice during our three day stay, plus we saw coati, toucans, parakeets, woodpeckers and hummingbirds among the other abundant birdlife." The room was clean and comfortable, the staff very kind and attentive, nothing was too much trouble. Our host cooked us delicious meals each evening. The wildlife experience was amazing, the sounds and sights of the jungle all around us. A troupe of howler monkeys visited twice during our three day stay, plus we saw coati, toucans, parakeets, woodpeckers and hummingbirds among the other abundant birdlife.